This treasure box could be filled with potpourri or jewelry or q-tips, or anything you want to keep covered in this handy handmade box. It is practical and pretty. 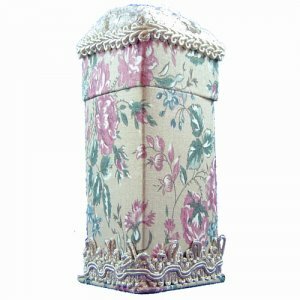 Handcrafted from binder board and covered with flowers on beige fabric outside and green fabric inside. This treasure box measures 5" high and 2-1/2" wide and deep. Binder board is used for book making. You can purchase this treasure box at http://shadesetc.ecrater.com for $7 plus shipping. An exquisite gift for a special person.